Since seeing that movie my boys have forced me to rewatch all the Jurassic movies 3 times. We busted out every dino we have and even added a few more to the collection. When we seen the all new Indominus Rex from Spin Master and all the cool things it could do we so know we had to have it! The Hammond Creation Lab has made the most fearsome dinosaur ever displayed at Jurassic World! 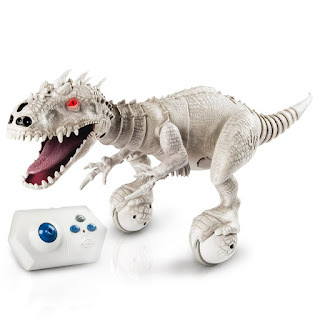 And now you can bring home the adventure of Jurassic World with the incredible Robotic Zoomer Dino, Indominus rex! Bring Indominus rex to life and unleash its stealthy, aggressive and unpredictable nature. Watch as it prowls your home, using True Balance Technology to hunt, patrol and explore its surroundings. With advanced IR nose sensors, Indominus rex can sense your hand and will respond to your movements. Use the customized Jurassic World remote control to program modes, record combo moves and guide its movements. Featuring real sounds from the Jurassic World film and color changing eyes that communicate mood. And it does so much! I love how it moves around my house and even gets mad when the boys pull on its tail! I think the charge can last up to about 35-40 minutes. My boys are yet to play that long continuously they take little breaks or set up other dinosaurs for the Indominus Rex to attack. It got the thumbs up from both of my boys this is a most have toy this holiday season!!! So that is the reason my boys love it, now let me tell you as their mom what I ADORE about it! Brandon is 8 and Quinn is 5 up until a few months ago they were together all the time! You would have sworn they were attached at the hip. Now Brandon started 2nd grade and he has entered that age where his little brother isn't cool anymore. As a big sister I get it. You want to look cool to your friends and impress them. As a mom it breaks my heart and poor Quinn just doesn't get why his BFF suddenly wants other friends! Why his brother doesn't want to spend every minute of everyday with him. Sometimes though we find an amazing activity or toy that brings them together again. Something so fun and cool that for a period of time Brandon forgets he is suppose to be a "cool" 2nd grader. And they play together, they laugh together and it is just like old times. As their mom this is my favorite part, the part where they are brother and have fun together. The part were I can hear their giggles through at the entire house. The Indominus Rex just happens to be that cool toy reuniting my little guys right now! Everyday Brandon gets off the bus and the first thing my boys do is get the chocolate from their advent calendars and the next thing they do is pull out their new dino! In the movie the Indominus Rex may have been a bad guy, in my house she is quite the hero!